Today I have swatches of the new Spell Polish collection called as ' Legends and Dreams' to share with you! Heather, the mastermind behind this brand came up with this new collection to hold lots of magical girlie sparkle. These shades lean towards the sheer side, allowing each layer to reveal the depth of layered sparkle. Spider Pearls - A lovely soft pink shimmer with holographic and iridescent glitters. Formula wise it was a bit thick for me causing uneven application. It does have nice opacity though. can get along with 1 coat but still i went on with 2. Shown here is 2 coats plus Topcoat. Riding on Coattails - A light coral pink shimmer with blue shimmer and iridescent glitters. Formula wise it's a bit thick but not as much like the Spider Pearls. This shimmer in it gives a pearly finish. Shown here is 2 coats plus Topcoat. Crown of Rubies - A gorgeous raspberry pink with holographic and iridescent glitters. Formula wise it was smooth and easy to apply. I loved this color so much, I didn't want to remove it at all! Shown here is 2 coats plus Topcoat. Glittering Owl - A beautiful warm violet purple shimmer with multichrome flakies. The formula was more like a jelly type but it covers really well in the second coat. the flakies are mixed very well in it which spreads nicely and evenly on the entire nail. Shown here is 2 coats plus Topcoat. A Dusting of stars - A stunningly bright royal blue shimmer with holographic and iridescent glitters. . Formula wise it was good and easy to apply. This color is so perfect and this totally enters my favorite polish list. Shown here is 2 coats plus Topcoat. Magical Bracelet - A lovely seafoam green shimmer with holographic and iridescent glitters. It's very sheer in the first coat. Shown here is 3 coats plus Topcoat. Puddles of Magic - A sky blue shimmer with holographic and iridescent glitters. It's very sheer in its first coat as well. Shown here is 3 coats plus Topcoat. Bottling Moonbeams - A periwinkle blue shimmer with holographic and iridescent glitters. It's very sheer in first coat even more than the above two. Shown here is 3 coats plus Topcoat. Firefly Fairies - A gorgeous spring green shimmer with holographic and iridescent glitters. It looks a bit bright in my pictures, it's more like a light spring green. Shown here is 2 coats plus Topcoat. Jar of Light - A spectacular warm yellow jelly base with gold holographic and red micro glitters. It's such a pretty polish, This one totally ranks number 1 in my favorite gold polishes. Shown here is 2 coats plus Topcoat. This collection has already been launched on Spell Polish official website. 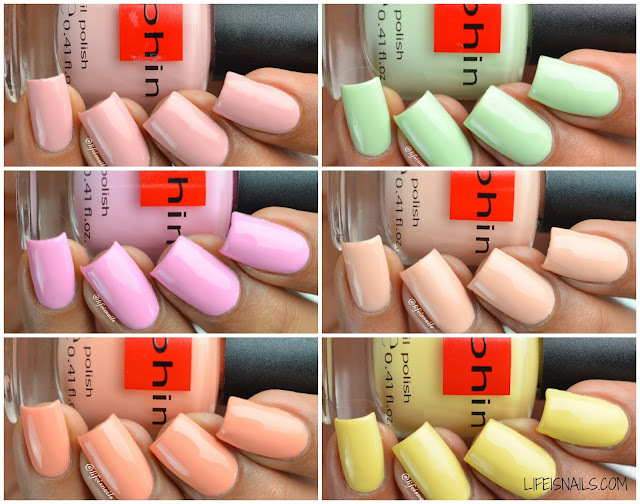 Today I have swatches of Sophin Macaroons collection to share with you! I have swatched sophins few months back and was pretty impressed with the formula and quality of the polishes. I got two collections, this time , Macaroons and Matt Allure collection among which I am sharing the delicious Macaroons swatches. This collection contains 6 pastel colors very much reminding me of the delicious macaroons I ate last week. Mmm...delicious they were! Okay not getting distracted wi8th the macaroons now, the formula in all these polishes was pretty smooth, the application was super creamy and easy. I applied 2 coats(thin + thick) for all the swatches down below and topped them with a fast drying top coat. The polishes are not named rather they are numbered. Sophin 340 - A pastel salmon creme with a bit pink tone in it. Sophin 342 - A lovely pastel pink creme, they all seem a bit sheer for the first coat but covers surprisingly well in the second coat. Sophin 343 - A light peachy pastel creme. This one was lovely on my nails, everyone complimented me when I wore this one for a family outing. Sophin 344 - A bit stronger orange pastel creme than the above one. This one was also in wishlist along with the pistachio one.Love them both! Sophin 345 - A pastel yellow creme. Formula wise so so nice! I am not a big fan of yellows but this one was different and I liked it very much! Since they are so perfect for Easter, I did 2 Nail art looks using these as well! The first one is this Easter colors inspired water marble nails, I used four colors for this and they are 341, 342 , 344 and 345. They spread in the water so well, I was literally in awe of how well their formula is for water marble. The second look I created is this mix match mani with dots and zigzag pattern. I again used the above 4 colors in this , used Azature faint white diamond for base and zig zag vinyl from www.whatsupnails.com to create the zig zag pattern. I hope you like them! Here & Here are the video tutorials for the two looks. You can get these beauties as well as others at their online store or with their stockists. 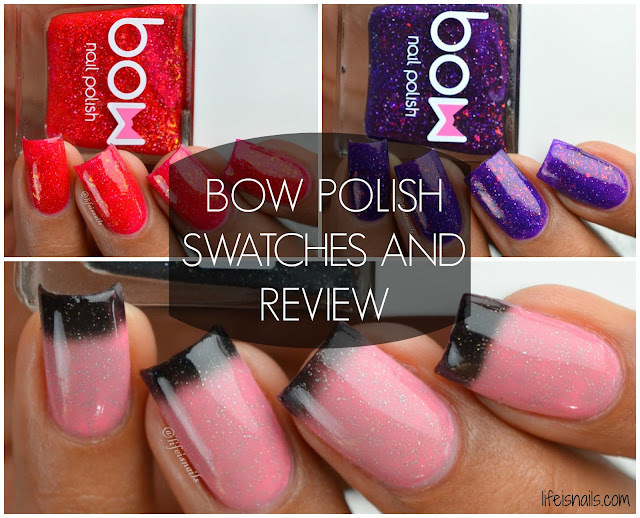 Today I am back with the swatches of a new to me brand "Bow Polish" lacquers. I got these 3 polishes in which 2 are from the Out of Space collection and one is Thermo top coat. Let me start by saying that I love the bottling very much, so exquisite. The formula was amazing, didn't trouble me at all with all those flakies in there. Let's look at the swatches now! Zodiac - A gorgeous purple jelly base with full of red and blue flakies and silver micro glitters. The glass flakies lies flat which is great considering the abundance of them in the polish. Shown here is 2 coats plus top coat. Grim Heart - A stunning red jelly base with orange glass flecks and red and silver micro glitters. The glass flakies lies flat in this as well. Shown here is 2 coats plus top coat. Thermo Topcoat - A very innovative polish created by Bow Polish. It's a thermal top coat as understandable by its name, it changes color from light gray (warm) to black (cold). it also contains micro and sparse holo glitters in it. You can use any base color for it or wear it on its own, both ways it looks fabulous. Shown here is 1 coat of Thermo top coat over 2 coats of Dance Legend 540 which is a bright pink creme. I loved the formula of these polishes, and the packaging as well which comes in a cute little box. I am so looking forward to trying more of their polishes in the future. My Top picks are the Thermo Top coat and Grim Heart.